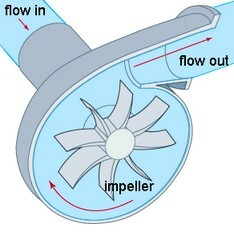 A centrifugal pump converts the input power of a rotating shaft into kinetic energy of a the liquid by accelerating the liquid through an impeller. 1. The head (H) as function of the volume flow at a preset speed. 2. 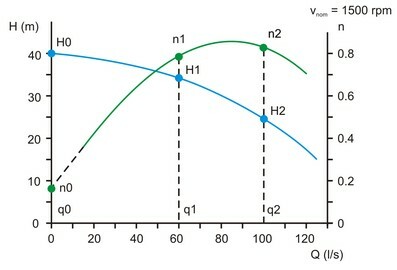 The efficiency (n) of the pump as a function of the fluid flow at a present speed. The efficiency is defined as the flow output power divided by rotational input power. To fit the polynomial curves, the heads and efficiencies have to be specified at three different flows. The first flow (q0) is zero. The other two flows (q1 and q2) can be chosen arbitrary. Note: some pump flows extrapolate the efficiency curves to zero at zero fluid flow. This would mean that at a zero fluid flow no power can be transmitted and the pump can never start! Therefore in this model always use an efficiency that is non-zero at zero flow. 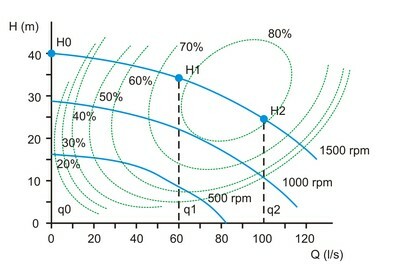 Some pump characteristics give multiple input speeds. This model automatically takes into account for varying input speeds of the input axis by transforming the pump curve using the affinity rules. Some pump characteristics give the efficiencies as regions. You have then have to estimate the efficiencies at the chosen flows q0, q1 and q2.